Convict Love Token Exhibition at M.A.D.E. An exhibition of 45 love tokens is on display at the Museum of Australian Democracy at Eureka (M.A.D.E.) in Ballarat and it runs from 7 October to the 21 January 2017. This is possibly the largest private collection of these tokens in the world. 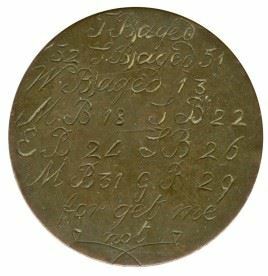 When convicts learnt their fate of being transported some made keepsakes by scratching a message on a small piece of copper. 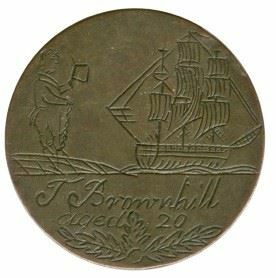 The most common pieces of copper were the 1797 Cartwheel British pennies made at Matthew Boulton’s Soho Factory in Birmingham, as they were an ideal size being 34mm, readily available and affordable. The tokens at the time were known as ‘leaden hearts’ and were made in prison workshops. The convicts gave them to loved ones and family members prior to their transportation to Australia. We do not know how many were made as they were unofficial but they are now rare. The Museum’s CEO, Sarah Masters, and its curator, Cash Brown, fully understood how to display these objects. They have the right lighting and numbered cards corresponding to the number given to each token. The cards have the written text that is engraved on the token and enlarged images of both sides of the keepsake. Some cards have the story of the convict on the flip side. Not all tokens are dated but those that do range from 1791 to 1843. The youngest convict was aged just thirteen, and most were in their twenties and thirties. Visit M.A.D.E. 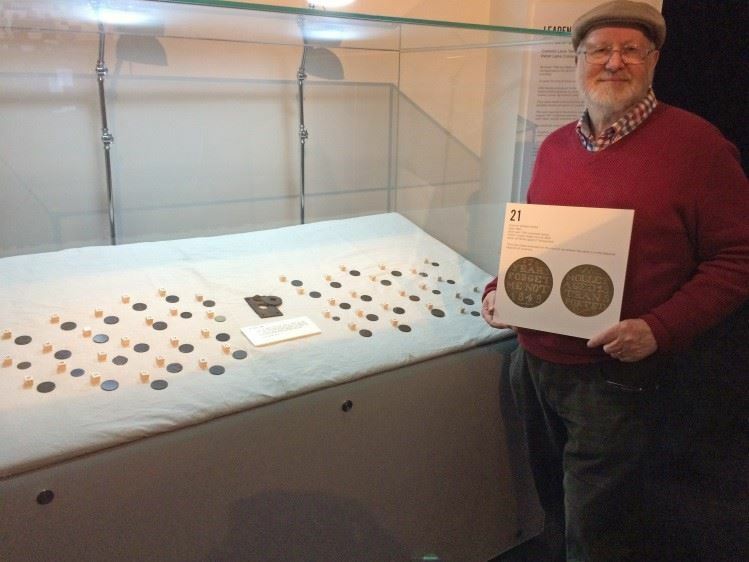 to see this excellent exhibition over summer and while in Ballarat have a look at the coins in the Gold Museum. It was established by the late Paul Simon, a former President of the Numismatic Association of Victoria. The Love Token Exhibition will interest Australiana enthusiasts, numismatists, history buffs, and genealogists with a convict ancestry. Also on display at M.A.D.E. are recently made bonnets to represent the 25,566 female convicts transported to Australia. MADE is open 7 days, 10 am - 5pm. 102 Stawell Street South, Ballarat, VIC 3350. See full details at made.org. On Tuesday, this week, a gold bracelet by Christian Ludwig Qwist (active Sydney 1863-65) sold at an auction in the UK for more than $120,000, inclusive of buyers premium (IBP). The bracelet was one of three pieces consigned to the UK auction house by a vendor associated with the descendants of Hugh Hamilton (1822 - 1900), a pioneer who arrived in 1841 and settled on land next to the Lachlan River in NSW. He established the Tomanbil and Boyd cattle stations but a severe drought in 1849 forced the closure of the stations. He then worked as the assistant gold commissioner in Ophir before finally returning to farming. Hugh Hamilton was the younger son of the Hamiltons of Sundrum in Ayshire, UK. The gold bracelet was decorated with oxidised figures of an Aborigine, kangaroo and emu surrounded by finely engraved scrollwork and engraved with the initials AMD. The catalogue entry speculated that the initials belonged to Hugh Hamilton's first cousin Anna Maria Dundas, daughter of James Dundas of Dundas and his wife Lady Mary Duncan, daughter of Viscount Camperdown, the celebrated Admiral. The second piece was a gold brooch attributed to Hogarth and Erichsen, circa 1860, oval shaped with kangaroo, emu and native flora. The brooch sold for approximately $30,000 IBP (a similar brooch, slightly smaller, with only a kangaroo and flora, sold for $13,640 in November 2014). The lowest priced item at approximately $4,000 IBP was a pair of gold ear pendants, attributed to Hogarth, Erichsen & Co., one pendant decorated with kangaroo and flora and the other with emu and flora. All three pieces came with what appeared to be the original boxes and the strong provenance no doubt adding to the desirability. The Narryna Heritage Museum in Hobart is hosting a weekend of events in conjunction with a book launch on the iconic Peddle Chair. - A "Peddle chair muster" on Sunday 11 September, 12noon - 4.30pm. A talk by author, Denis Lake commences at 2pm and visitors are invited to participate by bringing along a Peddle chair to learn more about who made it and where. Every Peddle chair has a story to tell. The Australiana Society will be at the Sydney Antiques & Art Fair. The fair is being held at The Kensington Room, Royal Randwick, Alison Road, Randwick from the 7th to 11th September. The Society stand will have a display of Australiana and will be promoting membership of the Society. We seek volunteers from our local Sydney and NSW members for assistance at the stand to speak with members of the public regarding membership, the Australiana magazine and activities of the Society. 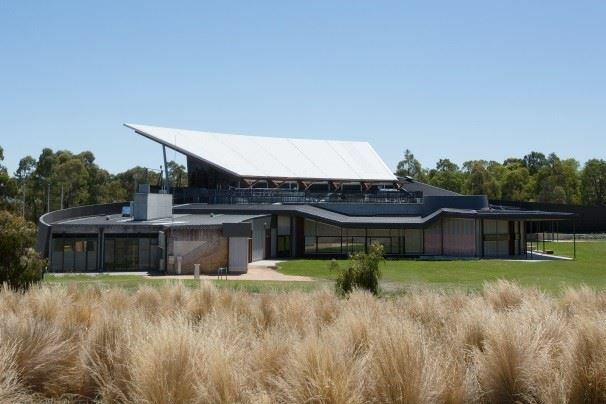 If you have a free morning or afternoon on Thursday, Friday, Saturday or Sunday, 7 - 11 September, and are happy to provide some assistance to support your Society, please contact Judy Higson, our Committee member by email: info@australiana.org.au. As a volunteer, you will be provided with an exhibitor's badge which provides you with entry to the Fair for all days, including the Gala Preview evening on Wednesday, 7 September, starting at 6pm. The first meeting of the Tasmanian Chapter of the Australiana Society is set for Monday, 12 noon, 8 August 2016 at a member's home in Hobart. Members who wish to join this and subsequent meetings should contact Colin Thomas. Please send an email to info@australiana.org.au for his contact details. The SA Chapter held their 9th meeting on 7th July. Read their meeting report in the Society News 2016 page. The Museum of Australian Democracy at Eureka (MADE) is holding an exhibition of goldfields jewellery from 16th April to 4th July 2016. MADE is located at 102 Stawell Street South, Ballarat, Victoria. The aim of the exhibition is to highlight history and innovations in 19th century gold decorative arts design and manufacture in Australia as direct result of gold rushes and the migration of those styles nationally and internationally. Please visit www.made.org for more information. Australiana Society has five double passes to the exhibition. The passes will be given to the first five members to send in an email to secretary@australiana.org.au requesting a double pass and including the word "Eureka" in the email. Our members in South Australia have started meeting on a monthly basis. The informal meetings provide an opportunity to get to know other members and to share our interest in all things Australiana. The meetings are hosted at a member's home with a light supper and members bring in items of interest for a show and tell. Interested members or non-members wishing to join the society should contact info@australiana.org.au. The Australiana Society has a grant of up to $5,000 for institutions to assist with the acquisition of an object of Australiana. For more information visit Australiana Society Grant. Peter Walker Fine Art in Adelaide supports Australiana by providing funds for the Peter Walker Writing Award, for the best contribution to Australiana.